This is the racerback bra clinically proven to promote good posture as well as relieve pain in the back and shoulders. The anatomical construction is reinforced with neuroband tension panels that activate and stimulate specific muscle groups to keep the body upright; the resulting controlled resistance increases core strength while supporting correct alignment of the chest, neck, scapula, and spine. The snug-fitting bra can be worn daily to help prevent injury by decreasing wear and tear on sensitive joints, or during workouts to boost exercise performance by enhancing range of motion. It has vented mesh panels and a moisture wicking fabric with anti-microbial protection that keeps skin dry and cool. Front 89% nylon, 10% spandex, 1% olefin; mesh back 72% polyester, 28% spandex. Machine washable. White, Black, or Beige. Fits tight. S, M, L, or XL. 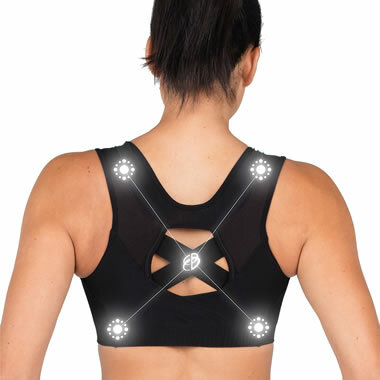 The Posture Correcting Neuroband Racerback Bra comes with The Hammacher Schlemmer Lifetime Guarantee. Items that we sell are guaranteed for their normal life under standard non-commercial use.